1. Get your current balance on all your credit cards. If you’ve been tucking away the bills as they come in, you may be in for a huge surprise. 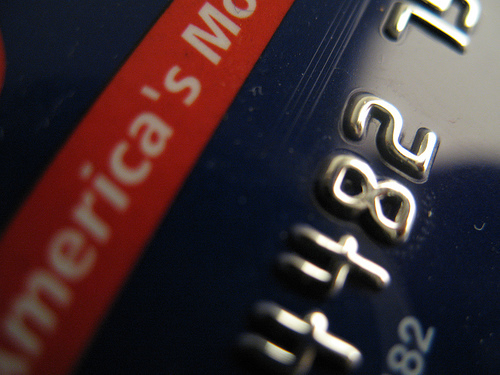 Many credit cards charge $39 for late fees and another$39 for being over the limit. 2. Write down the balance the due date, and the interest rate of all the credit cards. Write the highest interest rates first and continue in descending order. 3. Go ahead and call all your credit cards and ask for a lower rate. See if you can get a lower rate, even if it’s only 1%. The goal is to reduce your debt and make your payments go further. 4. Examine if you can switch the balance over to a 0% interest card for a few months. Sometimes you can do a balance transfer. Dump as much as you can into the credit card bill to lower the balance. Watch out, though, for balance transfer fees or any other switching costs. This may actually turn out to be worse than stay at your old card. 5. Pay as much as you can on the highest interest card. 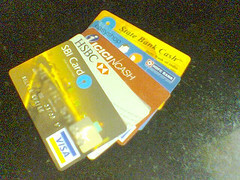 Part of the debt snowball method is to pay the most on the highest interest card and pay the minimum on the others. When you pay off the first card, put all the debt payments from it into the second card and pay minimum on the others. Continue until you pay off the cards. JD from Get Rich Slowly has more articles explaining debt snowballs. His approach is to pay your lowest balance first as a way to build mental momentum towards your goals.Trent from The Simple Dollar has a variation called the scared straight debt snowball. He also compares Suze Orman and David Ramsey’s methods of eliminating debt.If you liked this article, sign up to receive updates automatically through email. Activists groups are adopting the credit card industry’s own practices to try to stop students from drowning in debt. Instead of credit card applications, these marketers are handing out information booklets outlining credit traps and unfair practices that can victimize students. Instead of Frisbees and T-shirts, these marketers are passing out lollipops that read, “Don’t be a sucker.” Led by the U.S. Public Interest Research Group, the counter-credit card marketers set up tables on 34 campuses across the country. It was a guerrilla marketing campaign, funded by the Ford Foundation and organized by U.S. PIRG, to reform the way that credit card companies market to college students. I hope you read the rest of the article. Leave a comment on what you think. Ryan Rhoades, who graduated from the University of Pittsburgh last year with more than $13,000 of debt, remembers his credit-card company’s employees telling him not to worry about being unemployed. Lukasz Kozoil, formerly a student at DePaul University, says that Citibank’s representatives told him to fill in his tuition on a card application where it asked for income. (A spokesman for Citibank says, “no representative from Citi is authorized to fill in tuition cost on a credit-card application.”) Woodworth got his American Express card without a job, and it had a credit limit of $6,000. “Within three months, they upped it to $10,000,” he says. Thanks to Slevinat Flickr for the photo! My new host has Green Panda Treehouse.com up and running now. Please come over and check it out. Please leave comments about your feelings about it.